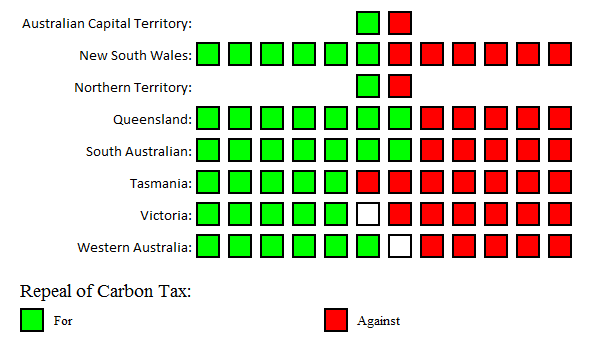 The Coalition is five votes short of half, and thus six votes short of a majority. With some minor concessions they could normally rely on support from the FFP, PUP, DLP and perhaps LDP. The last two votes, then, will require deal brokering with the AMEP, ASP and Xenophon. Given the lack of policies among the AMEP and ASP outside of their particular issue of interest (Motoring and Sports respectively), it seems likely that these two will be the most common legislative enablers for the Coalition. 34/40 gives me 85%, which is pretty poor even though you expect the Senate to throw up a few surprises. I think this pretty well demonstrates that House of Representatives primary vote polling cannot be used as a reliable analogue for voting intention in the Senate as a result of the greater number of parties on the white ballot. Also, simple quota calculations and estimations of transferable vote are probably not complex enough to deal with the counting process, and in future Antony Green's ever-useful calculators should play a lager role in my predictions. Last week we looked at the potential for the ALP to block the repeal of the Carbon Tax in the current Senate and, depending on the next Senate, trigger a double disillusion. Given this many groups to make deals with, it is unlikely that the Coalition will be prevented from passing the repeal after mid 2014. 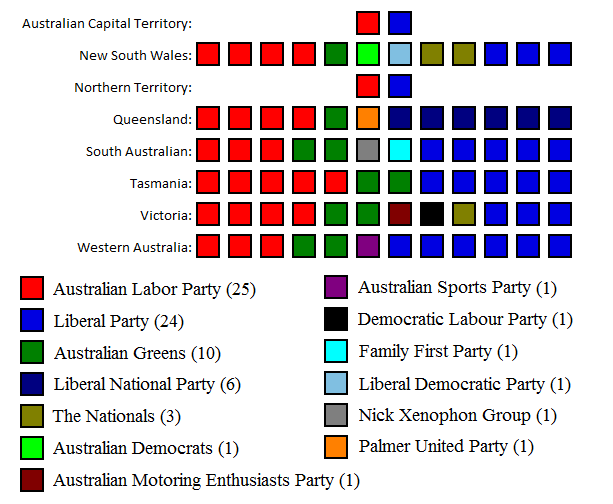 To block, the ALP would nead at least 38 votes. That is 25 ALP, 10 Greens and three others who will not be swayed by Coalition deals. 18. The use of taxes, levies and 'polluter pays' instruments designed to reduce and limit greenhouse gas emissions, as well as encourage business innovation in environmental efficiency. The Dems may be open to changes on the Carbon Tax, but not a full repeal. On the other hand, the LIB, LNQ, NAT, FFP and PUP candidates already support a repeal. The DLP does not state its position, instead proposing nuclear fusion as the way of the future. Nuclear fusion is something of a Holy Grail of energy production - cheap, efficient, safe, clean, capable of high base-load power output, and out of our reach at the present time. The LDP opposes "either subsidising or unfairly taxing any particular source of energy", though this is largely linked into ambitions for nuclear fission plant development, and they do not specify whether the Carbon Tax is considered 'unfair'. Xenophon opposes the Carbon Tax, prefering his own system of incentives rather than penalties. In short, do not expect a double disillusion any time soon.